PALM BEACH COUNTY, Fla. — As humans continue to infringe upon areas where gopher tortoises live, environmentalists have found a haven of sorts for the threatened species in Palm Beach County. "As their natural habitat in South Florida is being removed for development, we can actually save the population by removing those that are displaced and having them in suitable areas such as this," said Julie D’Errico, South Florida Wildlife Center rescue and release coordinator. South Florida Wildlife Center in Fort Lauderdale takes in and rehabilitates homeless gopher tortoises, which are considered threatened by the Florida Fish and Wildlife Conservation Commission. "Not only do we have gophers that are taken from their natural habitat, we also have the injured gopher tortoises. Some that are struck by cars," D’Errico said. "We currently have one that has a fractured arm and is in cast." South Florida Wildlife Center works with Palm Beach County Environmental Resources Management to relocate those homeless gopher tortoises, known as 'waif' tortoises, to Winding Waters Natural Area, off Haverhill Road. 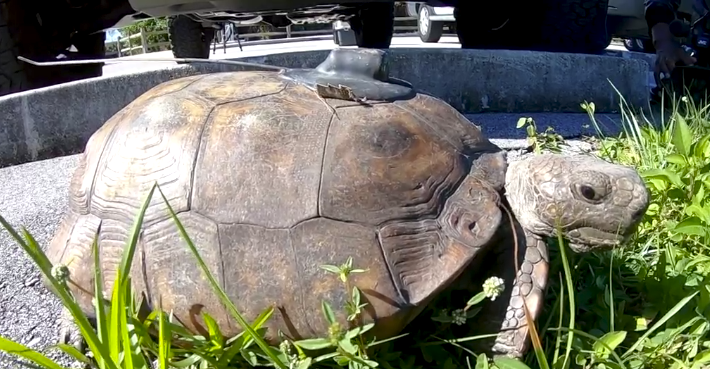 Nearly two years ago, FWC approved that area for 100 tortoise relocations. "We were actually the first waif tortoise relocation site in South Florida," said Benji Studt, of Palm Beach County ERM. The 51st gopher tortoise was recently released into Winding Waters. He was not hurt, but was found off Military Trail and ended up at the South Florida Wildlife Center. They couldn't figure out exactly where along Military Trail he came from, so they brought him to Winding Waters. He'll dig a burrow up to 30 feet long, which will also provide habitat to other animals, such as snakes, toads, and mice, making the gopher tortoise a Keystone Species that is integral to South Florida ecosystems. "This guy creates his home and then shares it with a lot of other animals," Studt said. About 10 tortoises on the site are equipped with a radio antenna on their shells to track their movements and progress, so researchers can show Winding Waters is a suitable habitat for more tortoises have been deemed homeless.